Share the post "Les Roches knows what it’s talking about when it says ‘We Are Happy!’"
Today is the International Day of Happiness, and what better way to celebrate than with a Les Roches production of Pharrell Williams’ world-famous song? So far, 674 videos from 87 countries have been created and we’ve just added to the number with We Are Happy From Les Roches. 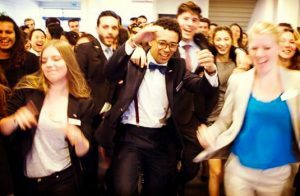 Les Roches knows what it’s talking about when it says ‘We Are Happy!’ Its students excel at having a good time. Whether it’s creating their own wine club and labels, descending the slopes of Crans Montana in an unconventional fashion, creating a massive human world map with a world-renowned video artist, or setting the Guinness World Record for the most nationalities in a swimming pool, Les Roches students really know how to enjoy themselves. But the International Happiness Day is not just about fun. The Day was actually established by the United Nations General Assembly in 2012. You might think that it’s a bit of an odd theme for a UN day, given that most UN days are connected to issues pertaining to human and political rights, such as water and HIV /AIDS. So, there you have it. Our happiness is connected to the happiness of those who are more vulnerable and marginalized in society. It takes active measures to engage with the local Swiss community through, for example, sourcing local produce. It offers a course specialization in Sustainability and Innovation for BBA students who want to gain expertise in the area as it relates to the hospitality industry. Recently, students raised funds to support the efforts of alumna Evangeline Hayco (Class of 2011) to provide a new fishing fleet for a community devastated by the 2013 typhoon that hit the Philippines. Les Roches is also supporting alumnus Vicente Concha-Max (Class of 2013) as he goes to Tanzania to work for an NGO for 3 months. Here in Bluche, the sun is shining and Spring is in the air. We are Happy! Happy International Happiness Day, everyone!